Yes. The joyous season is over. Want to know how I finally figured it out? For starters, I just ran out of the last drop of candy cane-scented anti-bacterial hand soap. Ditto for the holly berry wreath soap I kept by the kitchen sink. What’s more, the sugar cookie and fresh balsam scented candles I bought back in October, have met their last match, having melted down to tiny bits of wax. 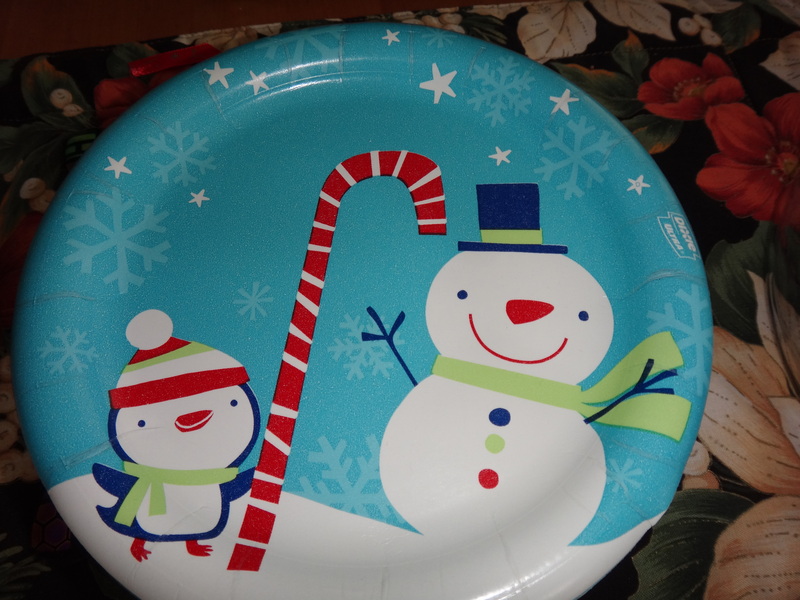 Now, I may be no Sherlock Holmes, but I deduced the holiday season to be a goner when I used the last paper towel with dancing gingerbread men to wipe up a spill, sneezed into the last tissue from a box bedecked with with purple snowmen, and used the sole remaining snowman and penguin-decorated paper plate to eat the very last of my daughter’s homemade cookies. Though if truth be told, there’s one more limited edition, pumpkin spice frozen waffle somewhere in the freezer. It’s been in there so long, it’s become embedded in layers of ice, stuck in the freezer’s hinterlands, and just waiting for some poor soul to fetch it from its resting place. Any takers? The last vestiges of the holiday are now all gone. Yes, the holiday season is over, though, if I’m not mistaken, it is almost Valentine’s Day. Which, as everyone in America knows, leads to Presidents’ Day, followed in March by Cesar Chavez Day (at least, in some states, anyway). And, so on. You get the picture. After all, why confine this festive salutation to just a certain time of year? Holidays abound all year long and, technically, every quarter brings a new season—winter, spring, summer or fall–right? So, why not say “Season’s Greetings” all year long? If you ask me, everyday should be a reason to celebrate the joy each season brings. Heck, the fact that we’re alive is a good enough reason to be gathering with friends and family, and having good tidings and all that. Frankly, I don’t need scented soaps and candles, decorations and gingerbread cookies in order to have goodwill toward all. Nor do I need to have a box of tissues, adorned with snowmen, in order to declare, joy to the world. All I need is fresh air to breathe, a song in my heart, and a skip in my walk. All I need is knowing that it’s a new day and I have family and friends who appreciate me, and I them. And, taking my cue from one of my favorite Christmas songs, all I need is you, my many readers who indulge me by visiting my blog, and sharing lovely sentiments in your comments. In other words, there’s no reason to end the holiday spirit just because December has passed, January is on the wane, and the holiday-bedecked products are nowhere to be found. Let’s continue to spread the good cheer! Let’s remember that life is worth living and that good friends are worth their weight in gold. And, to all the cynics out there who think I’m just another Pollyanna, no worries. Before you know it, the holiday season will once again be upon us, and you will be once again safe in the cocoon of “holiday” commercialism. Count on that. Now tell me. What will you do to keep the holiday spirit going? Call me crazy, call me out to lunch, but I have a feeling my birthday’s approaching. Maybe it’s nothing more than a hunch. Or it could be nothing more than intuition. On the other hand, I might have a sixth sense! Where’s Bruce Willis when you need him? Well, whatever it is, I suspect it’s true, because the birthday cards have started to roll in. And, I just love getting pretty, colorful birthday cards, don’t you? Especially the kind that wish me a very happy day, with many happy returns. And though, I’ve yet to figure out exactly what “many happy returns” actually means, I’m pleased as punch, all the same. But, if truth be known, these cards aren’t from family, friends, or even acquaintances. No, these birthday cards are from my neighborhood retailers, from the shops where I do business. After all, we have an understanding. I shop and make purchases, and, in return, they take my money. 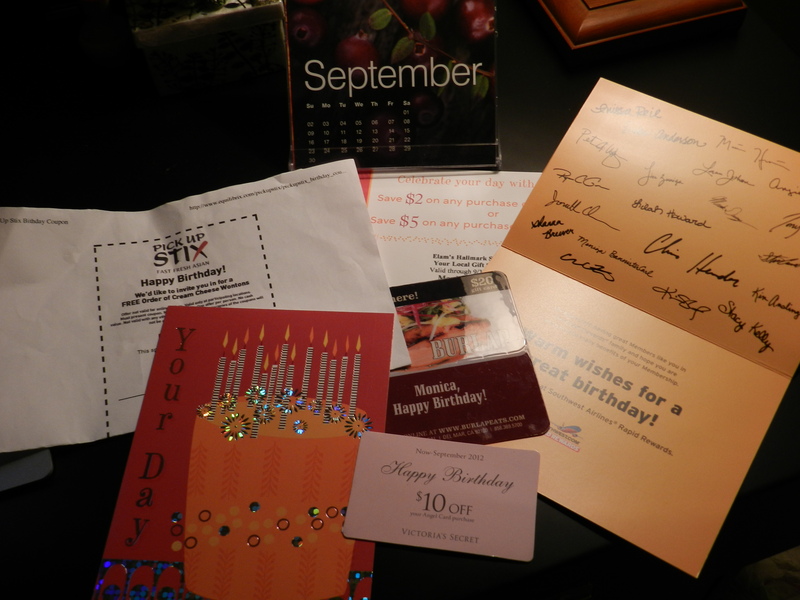 Oh, and once a year, they show their appreciation, for all my wonderful business, by sending me a birthday card. I guess they figure I shop there so often, we’re more like pals. Yeah, that’s the ticket. Clearly, they must care about me very much, don’t you think? I’m sure they don’t send these lovely cards to just anyone. Particularly not cards that come with gifts. Oh, didn’t I mention the gifts? $2 off any purchase of $10 or more! Does it get any better than this?? Victoria Secret also sent me a birthday card, and a coupon entitling me to $10 off anything in their store. Which is great news, indeed, because now I can get my annual pair of birthday underwear! Even the airline I travel on has gotten in on the action. They sent me a card festooned with brightly colored balloons that coincidentally matches their logo—and the card is signed by the entire crew! Too bad they didn’t think to include a free round-trip flight to anywhere in the world. That would’ve been way too cool. My car dealership didn’t send me a card, but this morning I did get an email, wishing me a happy birthday in all CAPS and two exclamation points, thank you very much. But, no free car. Not even a new set of tires. Oh, bother. Seems to me, if these merchants think enough of me to remember my birthday, the least I can do is have them over for dinner. Maybe we’ll go see a movie, too, and I’ll use the coupon I received, for a free small popcorn, from the local movie theater. Just me and my retailer pals, painting the town red, assuming I remember to bring the quart-size can of paint my local hardware store sent me. We can also go to the nearby takeout shop for a free order of Cream Cheese Wontons, followed by a complimentary dessert at the organic restaurant near my office. So tell me, what goodies have you received for your birthday from your usual shopping haunts? Society doesn’t prepare you for divorce. Still, you would’ve thought by now that someone would have figured out a way to turn it into a profit-generating machine, much the same way we do with weddings. Makes sense when you consider that half of first marriages and about 75% of second marriages end in divorce. In fact, it is so prevalent that with a little bit of pluck, a company could step right in and turn divorce into a cash cow. Billions of dollars are poured into weddings each year. Yet, except for all the family lawyers who are raking in the dough, divorce is a poor relation. Let’s face it, divorce doesn’t get half the respect that is reaped upon the marriage vows. For instance, we have bridal showers but no divorce showers, which could come in handy, if you ask me. After all, you end up losing half of your kitchen supplies, linens and furniture in the split. It wouldn't hurt for someone like Courtney Cox to have a divorce planner. No divorce planners either. Think how easy it could be! No fuss, no muss because the divorce planner takes care of all the pesky details, like the settlement, drawing up the papers, garnering your ex’s wages if necessary (because he’d rather pay for his girlfriend’s day at the spa than child support). Voila! All you have to do is show up and sign the final decree! There are no bachelor-again-to-be parties. You can’t place an order for a chocolate raspberry four-tier divorce cake for your Coming Out—Again! party. No divorce bazaars held at the convention center, where you can go and find a good attorney, get some therapy and a much needed massage to relieve you of all the aches, pains and thorns in your side that your spouse gave you. Worst of all, no divorce registries at Pottery Barn—or even Target. Trust me, I could think of at least two dozen items I would have liked to put on that registry. There is no divorce month. June is for weddings but what’s a good month to sign your divorce papers? For me, it was December. The 7th of December, to be exact, better known as Pearl Harbor Day. A day that will live in infamy, according to FDR. And where are all the divorce magazines? There are plenty of bridal magazines, but where can I get the latest info, all I need to know about the D word? Martha Stewart is all over weddings. Why can’t she toss us divorcees a bone? Actually, there is one magazine devoted to divorce, aptly called Divorce Magazine, but it’s only published twice a year. I don’t know about you but I couldn’t wait that long for my next issue. If brides can have a monthly magazine, then surely the rest of us should too. In fact, Brides and Divorce Magazine could be sold together. Two for the price of one. What a deal! Might as well, considering that half of all those brides will be wishing they had a magazine on divorce at some point. And who knows? Maybe having an issue of Divorce Magazine sitting on the coffee table would be just the thing to remind newlyweds that it takes effort to make marriage work. Divorce. It’s a simple, easy to pronounce, two-syllable word that doesn’t begin to convey the agony, the ripping of your insides that getting a divorce can bring. That, and the realization that your world will never be the same. So come on, Corporate America, make a commercial success out of this opportunity! And maybe, just maybe, it’ll help ease some of the pain. Women love to go shopping! I can say that because I’m a woman and I just adore shopping. What’s more, women love nothing more than to go shopping together–whether it’s to check out the Anniversary Sale at Nordstrom’s, a buying spree downtown, or simply to put a down payment on caskets. Caskets? Yes, you heard right. The unmentionables. Caskets. Caskets, plots, grave markers. The whole enchilada. At least, that’s what my friend Lucia had in mind. Several years ago, Lucia was about to have the type of surgery only a woman can have and thought it best to have her affairs in order. Naturally, she figured I should do the same, and not going with her was an option she wouldn’t accept, no matter how many excuses I conjured up. So shopping we went. Of course, this put me in a quandary. I hadn’t really thought about where I’d spend eternity. Perhaps Florida, where both my parents are interred. But I couldn’t imagine being flown across the country just to be buried in hot, humid Florida where alligators run rampant and hurricane season seems to last all year long. Nope. Florida was out. New York, my birthplace, was out too because there’s no one left there who’d visit me and I don’t want to have the only grave in the cemetery tangled in weeds and whatnot due to neglect. So I agreed to go with Lucia to a nearby cemetery that is conveniently located near the freeway on a sloping hill. We had an appointment with a funeral arranger and ended up spending the entire day taking a tour of the place, walking up and down hills, around bends and across grassy knolls dotted with grave markers. Everything was quiet except for the constant whir of cars speeding by. Words like tranquil and pleasant came to mind. A girl could get used to this. Yes indeed. Plenty of time to meditate, if that was my style. But I could learn, couldn’t I? A nice place for yoga, too, I’d imagine. All the things I never do now I’d have plenty of time for here. So I started to get into it and pretty soon I was asking for a quote on a mahogany casket, with marble headstone, and all the trimmings. Lucia, meanwhile, wanted to make sure her parents had plots along with her. She took her time, pouring over each of the options, the woods and the fabrics for the casket interior as well as the location for her three plots. What she wasn’t prepared for was the price for all three. No group discount unfortunately. We ended up leaving, having placed no orders for plots or caskets. We were just not ready to come up with that amount of cash. I had heard you could order caskets from Costco and I let Lucia know. As for me, I now had my wish list for when my time comes. For now, I keep it in a safe place, which I’ve told my son about. One day he’s going to be glad I took the time to go shopping with Lucia because having this list will no doubt come in handy. And if when the time comes, he can’t find the list, then he’s on his own. As for Lucia, she made it through her surgery with flying colors, though she’s still trying to save up for the down payment on the three caskets, plots, et al. Of course if you ask me, she should just wait for the Anniversary Sale. And so it begins. My blog. My words of mature wisdom, drawn from a baby-boomer state of mind. My keen eye, astute observations and ever so clever opinions, colored by my life’s experiences. My words, to mold and bend as I choose! A chance to carve out a niche. To make my mark. Ah wilderness. Here’s to the unknown, to treading new ground and forging new territory. Here’s to finally growing up. Confession: Though I love writing, whether it’s typing away at the keyboard or putting ink to paper, I am at this moment clueless as to where this blog will take me—and you, for that matter. It is a journey, my next step toward that goal we all are working toward—growing up. Divorce—or in my case, juggling divorce, death and job hunting—and the easiest way to lose 30 pounds! Plus everything else I’ve left out! So the sky’s the limit and no matter where this blog ends up, thank you in advance for coming along for the ride. Bette Davis once said in the tearjerker film classic, Now, Voyager, “Let’s not ask for the moon. We have the stars.” Doesn’t quite make sense to me as I’d ask for both, but Bette was one classy lady. A woman with backbone. And that’s what I’m going to be when I grow up.